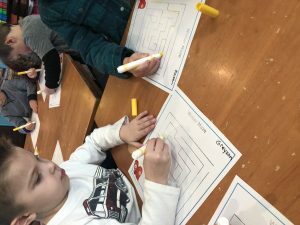 We are honored to be hosting another amazing educational tool from Education.com titled Winter-themed Cozy Maze. We cozied up during Letter D week and learned how to follow Directions through our Cozy Maze. 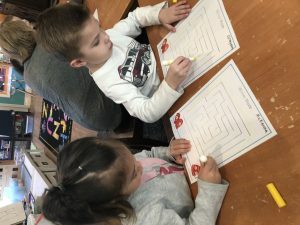 We moved through our classroom and followed lines, just like we would through our maze. We also discussed how we can’t make it through walls, so we then need to go back and find a new Direction to follow. 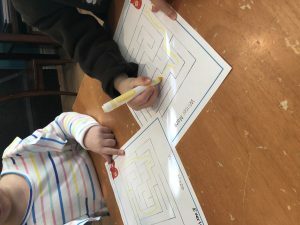 Once we made it back to our tables, we went through our maze with our “super magic Direction finger” and then put our markers to paper to follow our way in and out of our Cozy Maze! We had a blast!! 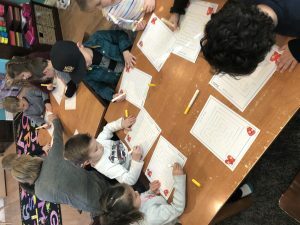 A huge THANK YOU to Shannon at Education.com for another amazing resource!! Cozy up with your little one and help them find their way out of this winter-themed maze! Check out other great resources at Education.com and let the learning and fun continue! Letter R in our Room!